I have been inundated with requests and there is not space here to address them all, nor do you have the time to scroll through such a list! You have had two overwhelming popular requests: More main course ideas, more side course ideas. My go to is always Vegan Richa (as you have probably noticed). I have never had a recipe of hers go wrong. Never! I am a fair cook but not a great one and her recipes are easy to follow and make. I began having vegan lasagna many years ago for Thanksgiving. It is all kinds of awesome and there is no reminder of ahem, you know what on the day. Depending on which statistics you believe between 43 to 50 million turkeys are brutally slaughtered for “Thanksgiving”. That people make this the center of their annual thankfest celebration shows what a brutal country this still is. However, times they are a-changing. A friend of mine who is a dedicated meat eater and said often she would never consider giving it up, mentioned to me just yesterday when discussing Thanksgiving that she saw a report on TV about the millions of turkeys killed, and that a “switch” suddenly went on off in her head. No more meat for her she said to me, in the gravest of tones. She added, shuddering, that she can’t imagine now how she ever could have eaten it. Now that is something to be truly thankful for. Okay. I missed my regular Thursday post (sorry!) but here I am still in time for the weekend. You haven’t done your food shopping yet have you? You have been writing me saying “more pumpkin recipes please”. I’m on it! Vegan Richa’s Pumpkin Coffee Cake with Pecan Crumb. Yummmm! Click image for all 25 Vegan Pumpkin Recipes to Make this Fall. I made this coffee cake Wednesday morning cause I had a bag of pecans I was munching on (I got them to bake with but . . . ) and then I saw this recipe. Oh my. Ohhhhhhhhh my! Easy 1 Bowl Pumpkin Cake, topped with Chai Spice Pecan Streusel. Just 15 mins prep. Soft, Spiced, Delicious. Makes 1 9 x 9 or 8 x 8 inch brownie pan. Preheat oven to 350 degrees F. Line a brownie pan with parchment. In a bowl, add all the dry ingredients and whisk well. Add the wet ingredients to the bowl and mix to just about combine. Let it sit for 2 minutes, then mix again to ensure there are no dry flour streaks. Pour the thick batter into the brownie pan. Even it out using a spatula. Make the Streusel by mixing everything in a bowl with your fingers or a spoon until crumbly, Add a tsp or so more oil if needed. Sprinkle all over the cake and evenly spread. Bake the cake for 40 to 45 minutes. Test with a toothpick from the center. Cool completely before slicing. Serve with turmeric pumpkin spice latte.. For a decadent dessert, add a light drizzle of plain sugar icing. What other types of vegan recipes are you interested in? One writer suggested vegan treats for trick or treat-ers coming to a door near you. I’ll see what’s out there then see you back here real soon. And on time! Highly Recommended ★★★★★ on Amazon.com. Click to shop. Buy It Now! At Amazon.com. Click image to shop. What are you up to this weekend? Busy, right? Just wondering if like us, Valentine’s Day has crept up on you. It’s in a few days! No worries. It’s not too late to do something truly special. Making something for that special loved one is truly special indeed. We will share recipes, ideas and provide links to our favorite vegan sweets and dessert sites. We have a recipe for horse treats too. So get ready to rock and scroll! 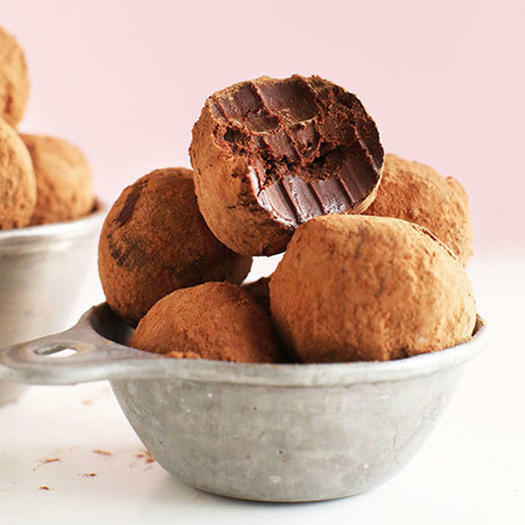 Two Ingredient Vegan Dark Chocolate Truffles. By Minimalist Baker. Quick. Easy. Perfect for Gift Giving. Chop the dark chocolate. Heat coconut milk. Pour over chocolate to melt it. Stir until creamy smooth. That’s the only thing that takes a bit of elbow grease. Or maybe I am simply out of shape. Chill. Scoop into balls. “It’s as easy as that”, adds Dana. And it is. You can roll them in all sorts of fun and tasty delights like coconut, finely chopped nuts, cacao powder (pictured) or icing sugar. Then chill. I found some gold sprinkles. I checked and was delighted to see they are Vegan. I was also excited because I picked up some small brown gifts bags for $1 each at Target that have glittery hearts on them. Perfect. And I have some glittery tissue paper in white and red left over from Christmas. How sweet. Sigh. It’s all so romantic. Here’s the formal list of ingredients. Next up. Wait until you taste this. One Bowl Vegan Chocolate Cake. Minimalist Baker. If you love baking and have a well-stocked vegan pantry you can make this right now — One Bowl Vegan Chocolate Cake by Minimalist Baker. Dana has a great tip about working with coconut oil in the comments section. Gently warm it in a microwave. I warm it 20 seconds at a time on medium until I get it at the consistency I want without getting it too hot. I have never tasted chocolate cake as good as this one. Here’s the links we promised for more sweet treat Vegan recipes for Valentine’s Day and more. This chocolate pudding is beyond terrific by Oh She Glows. Raw Chocolate Pudding. Image by Oh She Glows via My Vegan Delight. Click image to visit Oh She Glows for the recipe. Raw of course means just what it sounds like it does. It doesn’t require any cooking! How about breakfast in bed, Vegan style? Check out the link below from One Green Planet. I have perhaps saved the best for last — and that’s a bold statement. This recipe comes from my favorite Vegan cook — Richa Hingle. She doesn’t have 800,000 followers for nothing. You can find it among Richa’s 25 Valentine’s Day Breakfast and Dessert Recipes. Vegan Cinnamon Rolls with Maple Coffee Icing by Vegan Richa. These are our favorite picks for Valentine’s Day this year. Wait. What about the horses? Horses love treats. My oh my do they love them. Here’s something for them. Have any peppermint sticks or candy canes left over from Christmas? Crunch them up and put them in this easy and fun recipe. Talk about love! Grease a cookie sheet (or heart-shaped cupcake tin) well. In a large bowl, mix carrot, apple, corn oil, and molasses together. Fold in salt, oats, and flour until well mixed. Scrape the mixture onto the cookie sheet. It will be sticky.Use a sheet of wax paper between the “dough” and a rolling pin and roll out the mixture until it’s between a 1/8 and ¼ thick.Score dough with a knife to make it easier to break apart into squares after baking. Or, roll dough out in the same manner on the cookie sheet and use a heart-shaped cookie cutter to create Valentine’s-Day-appropriate shapes. Keep the bits between the cutouts of the shapes. Bake for 20 minutes or until brown. Let cool and then using a spatula and table knife break apart square or shapes. The extra “bits” make good treats, too! Thank you TSB. Oh. They have great horse books too.